Barbecue, beverages, and the beautiful game: what better way to spend a Saturday afternoon, and for charity nonetheless? 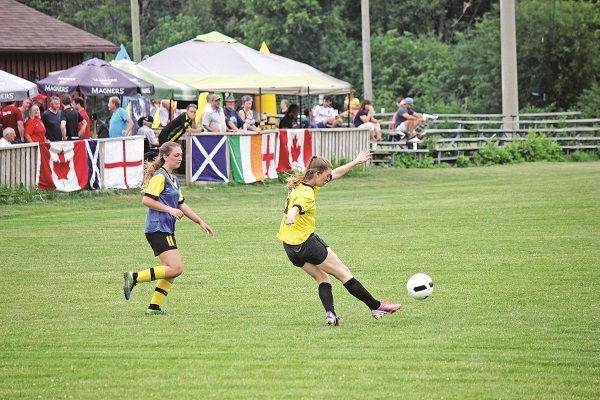 The Aurora Soccer Club held its annual charity event at the clubhouse, formerly Highland Park, on Saturday to raise funds for the Aurora Food Pantry. Close to two-hundred athletes, family, and fans of the game took in a handful of exhibition games, while bringing in a $500 cheque for the kitchen. Culminating in an annual tradition of an England vs. Scotland friendly, six squads took to the field throughout the day that also included live music and a bouncy castle for the kids, as well as a barbecue sponsored by Balaton Meats, Brick Street Bakery, and Exquisite Grill Catering.